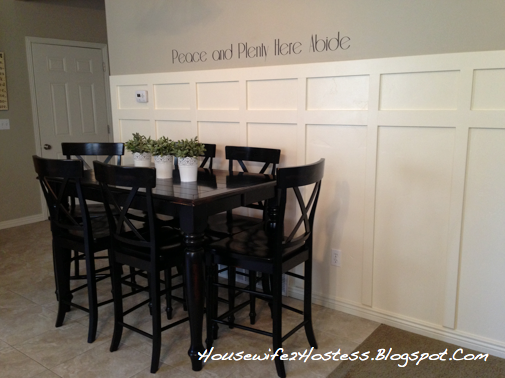 I’ve seen board and batten everywhere lately and I am loving it! So, I decided to put it on the wall behind my kitchen table, and the results were even better than I imagined! Did I mention I was able to complete this project for under $50?! Well, I was. Now, if you don’t have these items on hand it would obviously cost more. But for those of you who do or know someone that would let you borrow theirs, it is an easy (yet very time consuming) project. I am lucky enough to have my hunky hunk help out with the cutting and measuring, but I could have done it myself, mostly-ish. Start by creating a “frame” to make sure it’s level, so please use a large level. Make sure to find and nail to as many studs as possible for the most support. Lay out the boards and measure the distance between each to make sure they are evenly spaced. This was seriously the hardest part. Mostly because you are dealing with sixteenths of an inch and then you forget about the A/C, sockets and switches. Using silicone, smooth out all of the inner and outer corners and edges to make the paint look more professional. 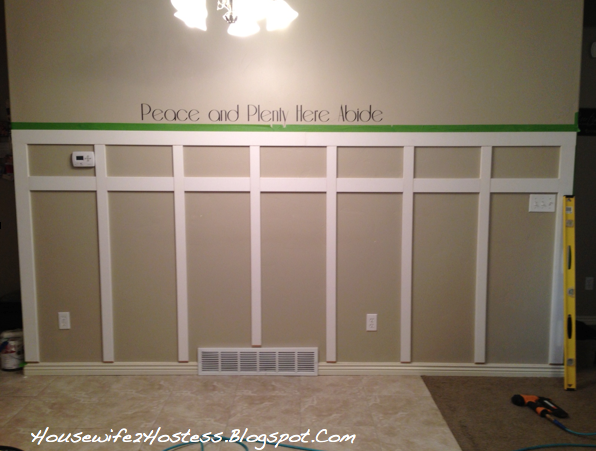 Fill in all of the nail holes and blunt edges with spackle and sand down. Wait for the caulk to dry before you tape off the outer edges for painting. I ended up doing three coats of paint to make sure I was able to get a thick coat over the dark existing wall. I am loving how it turned out! It adds so much light to the space. Where did you get your table and chairs at? I love them!!! Thank you! I got them at a store called Down East. I’m not sure if they are Utah thing or nation wide? 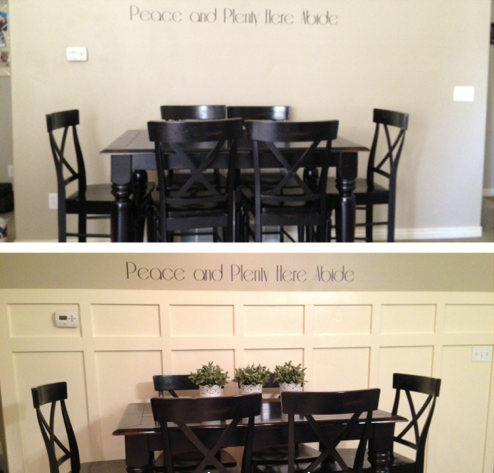 We are thinking of doing this in our house, but our walls are textured. Are yours? Did you run into any issues or is it noticeable with the end result? Thanks! Great question! Our walls are textured, its called old world. I just painted over all of it and its not as noticeable as I thought it would be when I initially planned this project. Looking back at the way it was, it looks like it was always missing that accent. I hope this was helpful to you! Good luck! Thank you Liz! I will definitely check out your blog! What is the height? I’m getting ready to do this in my house and I can’t quite decide what height is right. This was about 5 feet tall. And how tall are your ceilings?? We have nine foot ceilings. Except the open area where the banister is. Does the particle board stick out farther than the baseboard where they meet? Very neat project! 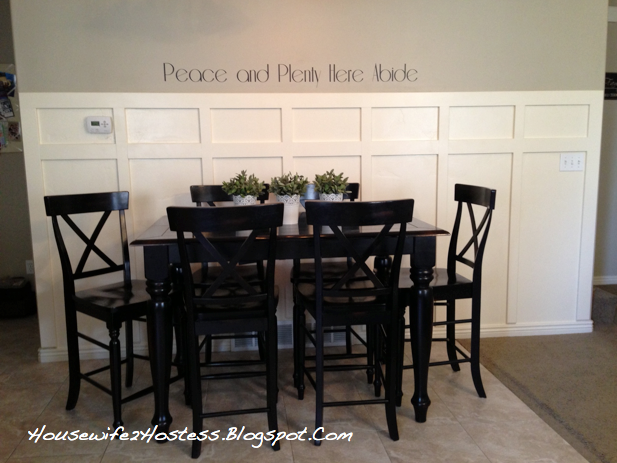 I love projects that make such a tremendous splash for relatively little cost. The difference between the before and after is so dramatic! Great project! What colors are the 1) the wall and 2) the “board and batten”/trim? They look great together and go especially well with your black furniture. The wall color came with the house, I’m not sure what its called. The board and batten was pained “almond white” by glidden. Hi! I love how you made this look so effortless. 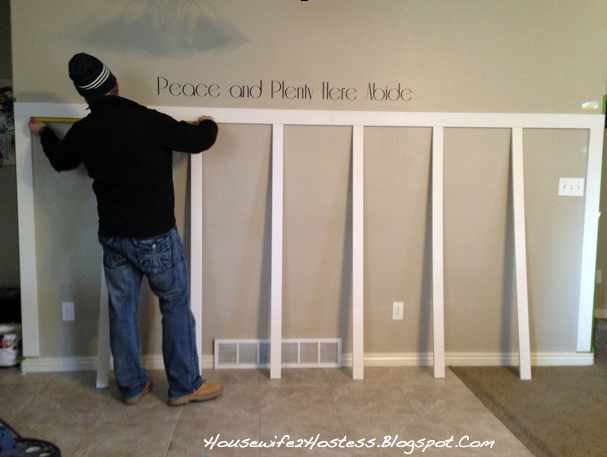 I want to do this project in my home and I am just getting started with home projects myself. Particle board trimming: 2.5 inch and 3.5 inches – I just want to know what the measurements refer to exactly so I get the proper materials. Also, did you paint the entire wall after the trim and batten were put up? Or, did you paint the trim prior? I’m so excited to hear that you are a DIYer!!! So, when you go to home depot, in their trim and baseboard section look for a simple rounded corners piece of trim (this came in white.) It can be as thick or thin as you like, I just used two different sizes for mine but anything will work, as long as you LOVE it. Then once it was all up I painted the whole thing. Way to go!!! I would love to see how it turned out! Do you have a link? Great job looks lovely. Did you not consider painting the wall first as it might have meant less work to finish the painting? Thank you so much! Thats a good idea, I still needed to paint the nail holes and things anyway. Hopefully, that helps! Some were some wern’t, its not too heavy so it was fine for us! Good Luck with yours! Love this project. i just sent it to my husband and were gonna try it this weekend. I am reading thru comments and did you say the wood was PRE painted like you bought it from the store pre painted or did you do paint it then apply to walls? This looks amazing! I’m just curious- what does it look like on both ends from the walls to the side? Did you paint the edge of the batten the colour of the adjoining wall or white like the rest of it? Just wondering how to handle rounded corners. Would the end vertical piece line up with the “edge” of the rounded corner? This has been my hang up when thinking of doing this in my home! How would you handle rounded corners with an adjoining wall? This has been my hang up when thinking about doing a project like this! Thanks! What color of paint did you use? I love the softness it adds….. 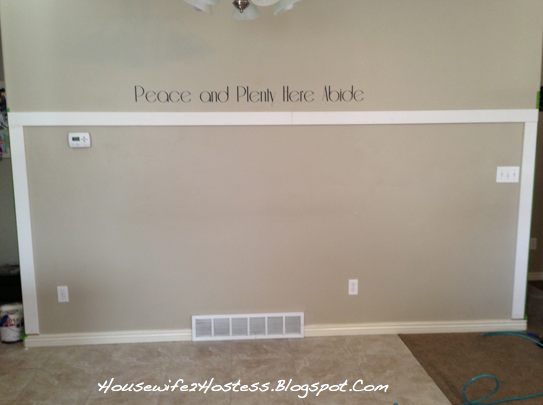 I want to do this on one wall but I have brown baseboards. What would you recommend?